Meditations on a Meditation | "Northern Crossings"
Interesting titles for the days of Holy Week. “Maundy Thursday”, “Good Friday” and “Quiet Saturday”. You have to have some faith background and a certain amount of discernment to understand why Friday would be considered “good” when the creator of all things died on the cross. There is also a certain amount of discernment needed to understand why Saturday would have been quiet. Outwardly I get it. Disciples hiding in locked rooms; depressed women trying to get ready to bury their Lord while celebrating a feast that the discerning understood was all about the Lord that they were getting ready to bury. Not much was happening on that Saturday unless you once again discern some mysterious sentences and theological hints from the Scriptures. There is a certain importance to Quiet Saturday but has been lost to the contemporary mind. The church has looked upon this day as a day of prayer and meditation, introspection and preparation for Easter. The early disciples I am sure were praying that they be left alone. I’m sure they meditated on the words of their dead Rabbi. I am sure they looked inward at all the ways they failed Him and they prepared for His burial. bring the Easter Lilies in and there’s always something going on where it seems impossible to just sit down and think let alone be quiet. So I am meditating upon a meditation in which a pastor talks about the fact that the church is quiet, everything is gone from the altar and he is looking ahead to Quiet Saturday. He quotes the favorite Christmas hymn and notes that a silent night holy night was broken by the sounds of the angels singing, and the baby crying, and Shepherds running through the hills into a quiet town to behold a wondrous site. There is none of that on Quiet Saturday. The day before was all full of action. There were the sounds of hammers pounding nails in human flesh, the screams and crying of the dying, the laughter and derision of the soldiers and the chief priests and the scribes. There was not a lot of quiet until the end when the derelict on the cross cried out “it is finished”. The meditation I am reading talks about how all the tears have been wiped away and the whole creation is still, waiting for what might happen next. was the day that Jesus went into hell. Depending upon whom you want to listen to Jesus went there to free the souls long imprisoned sans the damned, and release them by His triumph. Some go so far as to say that he descended into a death deeper than death to embrace in love even the damned. The point is we don’t know exactly. We know that our Creed says he descended into hell. We know from our traditions that no one believes he went there to suffer since that took place the night before. Peter says He went and preached to the souls imprisoned. The Christian faith is that he went there, that it is a real place, inhabited by real human beings and other things and it is not a place we wish to go. To have a Pope deny the existence of hell adds to the noise of a society that can’t believe anything anymore except the lies that are forced upon it by the narcissistic blasters of the truth. I remember watching a program about an older priest whose name I cannot remember. So shattered was he by his Vicar’s pronouncement in a Bible class that hell could not possibly exist if God is love, that he took the vicar to task and made him apologize for what he had said. He told him we must preach about hell and promulgate it because it is a primary teaching of the faith. And then he smiled, and looked at his Vicar and said “hell is real place, but only a madman would believe that anybody will inhabit it”. Well good for you Father and your attempt once again to control and tame God who sent His Son so that it doesn’t have to be inhabited by anyone but the devil and his angels. Whatever happened on Quiet Saturday happened in a place that Jesus said existed. It is fascinating to receive so much of our piety and our meditation down through the years from people who are now on the brink of denying a prime tenant of the faith they claim to protect. The papal brouhaha over hell makes it hard to be silent. The tweets and the e-mails that blast our day do not stop because Christ’s dead body is in a tomb. The constant babel from the TV and all the madness that takes place in March makes it hard to be quiet. 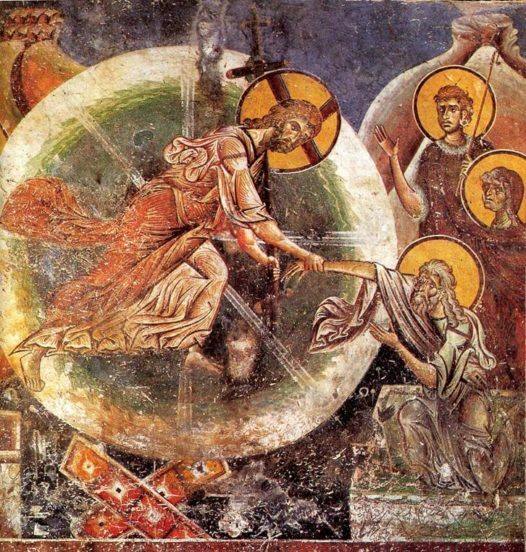 Spring break and waiting for the winter to break makes it hard to concentrate on a distant rock hewn tomb let alone the alien concept of the harrowing of hell by a triumphant Redeemer. The meditation that I meditate on was written by Richard John Neuhaus and entitled “This Most Silent Day”. He is an alumnus of the Seminary which I attended, and who later in life became a Catholic Priest. I would love to know what he thinks of the brouhaha about hell today. His meditation ends with this magnificent denouement that itself looks to tomorrow.